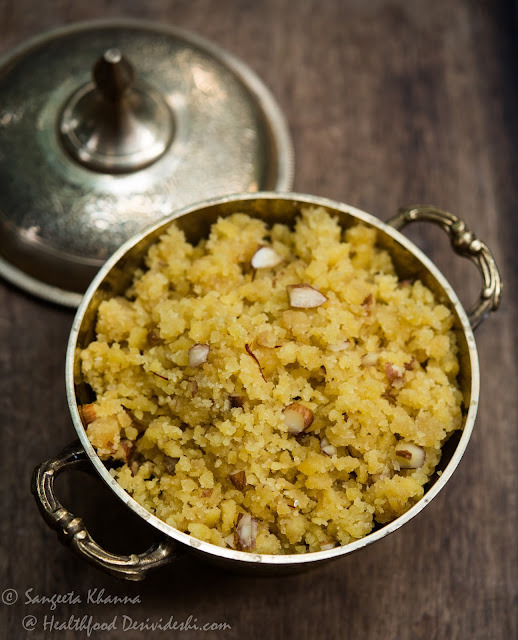 Mung ka halwa is one dessert which is seen brushing shoulders with brownies, tarts, tiramisu, truffles and the likes on the modern party menus. A traditional recipe which has survived the test of time well. It is definitely higher on calories but if you eat sensibly it makes an enjoyable dessert, and if you cook it sensibly, it doesn't make your arms ache and your tummy grumble. Believe me. Many of us dread making this halwa simply because of two reasons. 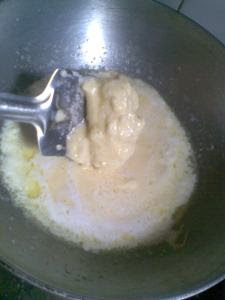 One, it is too heavy and two, it takes a lot of stirring and mixing and whipping while cooking it. So much so that your arms are sore the next day. Right!! This has been my signature dessert for many large get-togethers and as I have made it many times and in large quantities. I can say I have worked on ways to make it a bit easier and healthier, I mean a bit low on ghee and that too when you make it in smaller quantity. Soak the mung dal in water for 2 hrs or overnight and grind it in mixie to make a smooth paste, you'll get about 2.5 cups of mung paste. Now heat ghee in a large thick base kadai and coat the kadai well with ghee all over, keeping the flame very low, pour the mung paste in it and stir well. The first thing you notice is, that the mung paste becomes lumpy and sticks to the base of kadai. This is enough to scare a first timer, but do not worry and keep stirring after every few minutes. Normally it needs to be stirred and whipped continuously. To make it easy, spread the paste in a layer in the kadai and let it brown for a while. 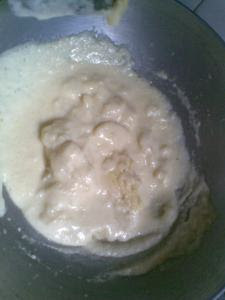 Repeat the process until the mung mixture becomes nicely browned and aromatic. Add sugar and put off the flame. 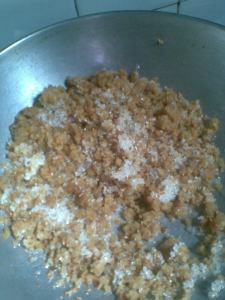 Mix well and cover with a lid and let the sugar melt and get absorbed into the halwa. Some people add cardamom powder for flavor but I feel that the aroma of fried mung daal is so delicate and mildly aromatic, that any other flavoring agent is not needed. 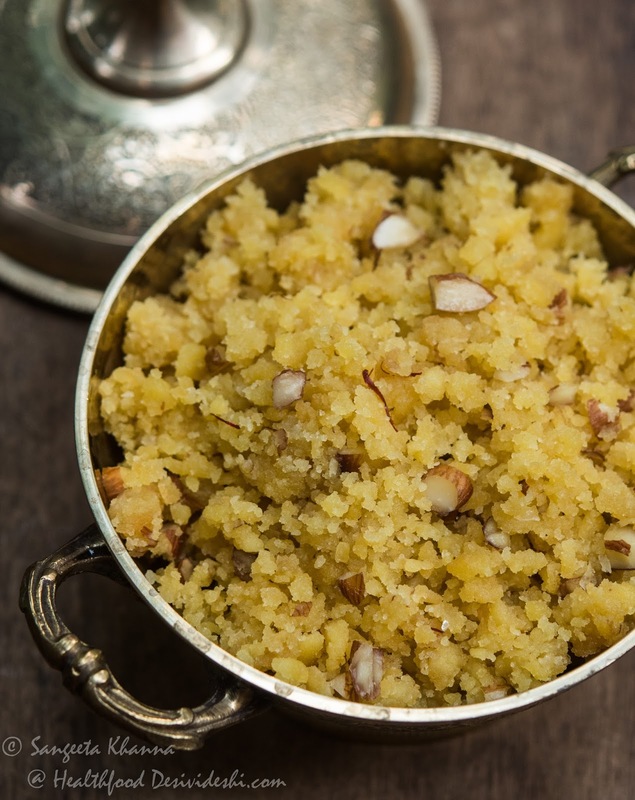 Mung daal halwa should taste like mung daal and not elaichi. Though you may go by your own choice. Add cardamom, rose water or whatever spice you like. 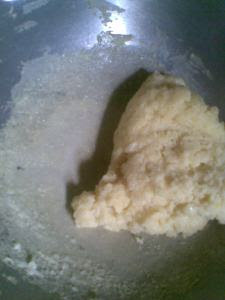 You may need to sprinkle a little milk if the mixture has become too dry. 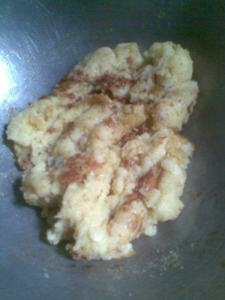 Mix well and throw in the slivered almonds (any type of nuts and any amount and serve hot. The halwa keeps well on room temperature (in winters here) for about a week and in the fridge you can keep it for months. Just heat it in the microwave and serve when needed. I made it for Arvind's birthday as halwa (Kadah prasad) is made for such occasions traditionally and this time I choose mung ka halwa as he said it had been ages since I made this. These are some of the foods he loves. 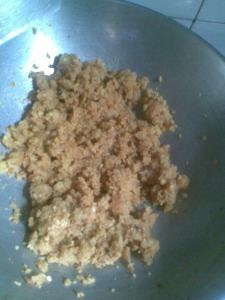 I hope you noticed how I turned and stirred the cooking halwa only when it gets browned on one side. That is the trick to not keep stirring it all the time. Try doing it and let me know if you liked this slightly dry mung ka halwa. You can add a little milk every time you reheat it before serving, it gets moist that way. hey thts my fav...luks very tempting. 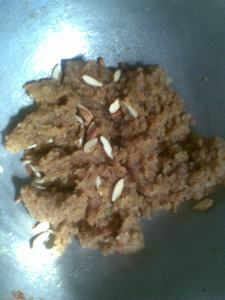 I love moong dal halwa and my Amma makes it superb!! 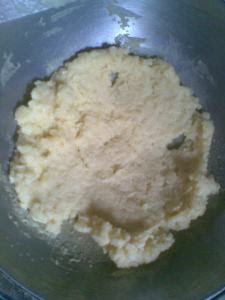 I made it only once and got a satisfactory result, it is quite a job na! ur recipes are a pleasure to go through. Belated wishes to Arvind ji. Good way to make him feel so special. The color and texture of the Halwa is perfect Sangeeta. I love this halwa but can have only a bite or two. You are right ... the soaked version does need a lot of ghee .. but a non stick pan always helps. Feel like picking up all that badam from your halwa bowl. :-) Great recipe Sangeeta! Thanks for sharing this healthy food. I like this dish and also your besan ka Halua too. thankyou Pari for your wishes!! yes Sharmila...i have seen your low fat version n i have yet to try that roasted version...i make it with unroasted mung powder otherwise..
it's worth the effort and no other version tastes the same!! thanks Asha for the award....sorry for being lazy for posting the award...will do it soon. Sangeeta, moong halwa is a staple in Malwa region, especially in Indore, during weddings or any kind of parties. It tastes best when floating in ghee and that is one of the reasons I do not make it at home. But your version looks delicious and healthy. I think I might just try it. Wow...halwa looks so tempting and yummy.